Today I'm singing "Happy Birthday" to ……. my book. Yes, I know, that may seem a little odd. It's only a book after all. But, because God used the writing of this little book to teach ME about just how wide and long and high and deep His love is, I feel like I need to celebrate! If you know my story, you already know that before I began writing Parenting the Wholehearted Child several years ago, I was basically best friends with shame. I was ceaselessly striving for perfection. And failing. And because I struggled to accept God's grace for me in my ongoing weaknesses and brokenness, I struggled to give grace to my kids in their ongoing weaknesses and brokenness. But through the writing of the book, God opened my heart to His wild, transforming, too-good-to-be-true-but-it's-actually-true, grace. And it changed everything about how I live and parent my kids. So a celebration is in order. Don't you think? Me too. Ok, let's do two things to celebrate. First, I want to share an excerpt from the book with you. This excerpt comes from chapter three where I share a conversation I had over and over again with God about feeling so unworthy of His love. And I want to share it with you because …. maybe you've had a similar conversation with God? Maybe I'm not the only one? And I want you to know that what Jesus said to my heart in this conversation is the very same thing He says, in His Word, to each and everyone of us. Me: Jesus, I am such a mess. I can’t believe you chose to die for a sinner like me. Thank you for giving your life for mine. Thank you for your divine exchange of my sins for your righteousness. It makes no sense that you, my King, would die for me ... but you did. And I love you. Now I will make you proud of me. I will make your death on the cross worth it. Jesus: Jeannie, my child. I chose the nails for you because I love you. I am already proud of you. There is nothing you can do to make me love you any less, and there is nothing you can do to make me love you any more. I want you to rest in that. Me: I know, I know. And I’m thankful. But you died for me. A painful, gruesome, humiliating death. And what do I do? I still sin. I still take my husband for granted; I still lose my patience with my kids; I still think awful thoughts about the person who rushed to get in front of me in the grocery store line. Oh, and I’m not very good at loving my enemies. I’m good at faking it, but deep down, I’m not always feelin’ the love. Jesus: I know. And I love you. I accept you just as you are. In me, you are worthy just as you are. In me, you are enough just as you are. I have you covered. And I am still at work, transforming you into my image. Me: I know, Jesus. But just listen — I want to do something, anything, to show you how thankful I am for what you did for me. I will keep trying to make you proud. Jesus: My beloved Jeannie. All I want is you. Walk with me. Keep company with me. Pray to me. Enjoy my presence. Delight in my kindness. Dance in my faithfulness. Everything that matters— everything that reflects holy, Christlike living—will flow from your loving me and abiding in me. Cease striving and know that I am God [Ps. 46:10]. Surrender to my grace, to my unconditional, unrelenting, never-ceasing love for you, just as you are. This is the message we (and our kids!) desperately need to hear. The most important thing we can do for our kids is captivate them with what Jesus has already done for them. Knowing how much they have first been loved by Jesus is what inspires and empowers them to love like Jesus. He did not give His life for us so that we would carry the crushing burden of trying to please God through any merit of our own. Jesus has already made us pleasing to the Father. (Phil 3:9) And as we remember this truth, our trust and obedience will spring from a heart of gratitude, not obligation rooted in trying to make Him proud. Oh, but that can be so very easy to forget. I know. I forget it daily. So I keep running back to God's Word to remind me who I am in Christ. Because the world gives us a very different message. The world tells us that our worth is anchored in what we do and how we're puling it off (whatever "it" is). But in God's Word we are reminded that our worth is anchored in Christ - in what HE did for us. That's why I keep a set of personalized scripture cards on my kitchen counter. These cards, from Sweet as Honey, were given to me as a gift not long ago and now I am mildly obsessed with them. So I'm giving one set away to celebrate my book's birthday. 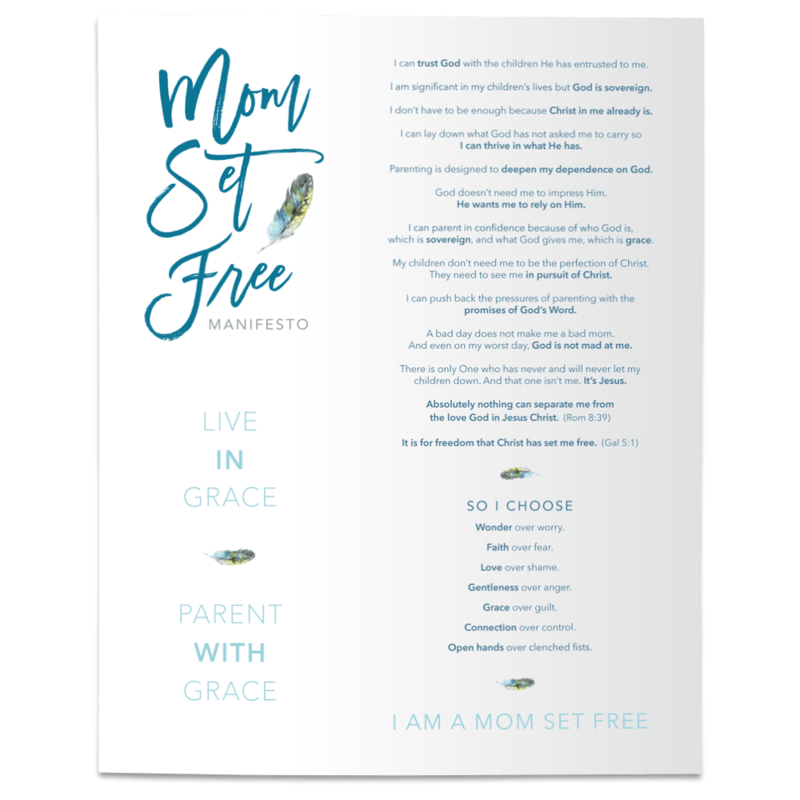 To win, all you need to do is leave a comment below- share just one thing God showed you about His grace through Parenting the Wholehearted Child. Or just one thing you learned through the book about God's grace that has impacted your own life or your parenting. So really, just say anything. And if you haven't read the book, you can grab it here, then leave a comment below that you are now a proud new owner. And you'll be entered to win. Finally, I just want to say thank you. From the very bottom of my heart, thank you. I am so grateful for each and everyone of you journeying deeper into God's grace with me this year. It has been a wild and wonderful ride. You have encouraged me, you have inspired me, you have allowed me to be vulnerable with my parenting struggles and failures, and you have been God's love to me.